Space! The final frontier ... cut, cut ... stop this! We already had it. What though about receiving visitors from outer space - having some aliens for dinner? No, the aliens are not going to have you for dinner. Well, let me get to it in a slightly different way. Just slightly. Do you connect some kinds of foods with movies? Or vice versa? What about cooking something you saw in a movie? Let us come back to our aliens and move right away over to France. Sorry, if you got this wrong! It was not my intention, just put the words a bit of ... don't know. Anyway, you might know the famous French actor Louis de Funès. Right away, different movies come to my mind, that deal with food. One of it has the French title La Soupe Aux Choux. That brings us straight away to France, as I said, and to the aliens, as I said as well. The main character receives a visitor from outer space, because of food, that is, a cabbage soup. Well, the movie contains also some ... well, eh ... just concentrate on the soup for now. My intention is not to conjure up some extra terrestrial life. No! I simply like to reproduce such a soup and ... use up my leftover cabbage in the kitchen. By the way, this is not going to be fast food. We are taking some time to do this herby cabbage soup. After slaughtering the cabbage we can get into things (Hey, who said, we could do this without hurting something ... ah, no worries. Things will be fine!). Good! I used cabbage already in my last post. I got a comment, that 'cabbage is hugely underrated as a vegetable'. We don't want this to be, do we? Besides that, if you take a closer look, you find more cabbage recipes out here on my blog. Hm, well, at least one more. Let's work then: Herby cabbage soup. Plan about two hours, to be generous. Remember? No fast food! On top of it, it's all made from scratch. Well, a lot of the above mentioned things (cutting) you can do as we go. At least this is the way I prefer to do it. Therefore, whilst heating the butter in a large pot, you concentrate on the crying (onion) and then add them to the pot to let them start to soften a bit. Now you devote your attention to the cabbage and then to the carrot. Obviously, the result of that leads to more vegetable in the pot. It would be quite helpful to put the kettle on to get the water boiling. Why not take some more water. That way you can treat yourself to a nice cuppa of tea. We are in no hurry (you can do this at other times, if you insist). The water you are not using for your tea goes into the pot. The cabbage should be covered. If not, you used too much water for your tea. 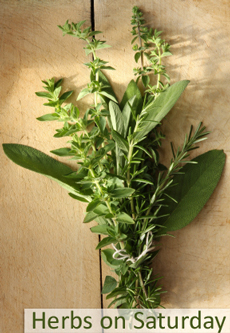 The bouquet of herbs, to which I also like to refer to as a bouquet garni, goes into the pot as well just before you put the lid on and bring all to the boil. After that is done, we have plenty of time for tea and for the potatoes and garlic. Should it be in boiling mode, we reduce the temperature and let it simmer for an hour. Depending on your skills, though, you could also manage to do some other things during that time ... you think of something for yourself. I'm not going to tell you, what I did. Back in the kitchen, right in front of our soup, yes, after one hour has passed, we throw in the potatoes and garlic. Season the soup with fleur de sel and pepper. I like to use fleur de sel (hand-harvested sea salt), because traditional fleur de sel is collected off the coast of Brittany - just to give a bit more of a French touch to it. Having come that far, we are nearly through. Just another half an hour to simmer and then we are ready. What to do again? Maybe set the table? I'm planning on having a candlelight dinner. Oh, well, yes ... I put a candle on the table and light it. If it is according to your desire, you might open the meal with a small glass of pastis - as also seen in La Soupe Aux Choux. As you see on the picture as well, you have a nice baguette ready to go with the herby cabbage soup, too. Before I forget, the bowl for the soup is also from France. What you can't see here is, that it has a picture in it with a famous place in Normandy, which has also something to do with a place in Cornwall. I just mention it, so you get a rough (yes, again) idea. Should you have anything of the baguette left, you could finish your meal with some cheese. Yep! I did it! Let us now come to the side effects of the soup. If you remember the movie La Soupe Aux Choux, you know what I mean. Up to this point, where I am writing this done, nothing happened ... and no, I didn't get any visitors from outer space. I might get a few visitors, though, reading this post or even trying this recipe. Is everything said now? No, not yet, not yet! Since we used our lovely bouquet garni, I decided to enter this post into Lavender and Lovage's Herbs on Saturday challenge, even though, it's Wednesday. 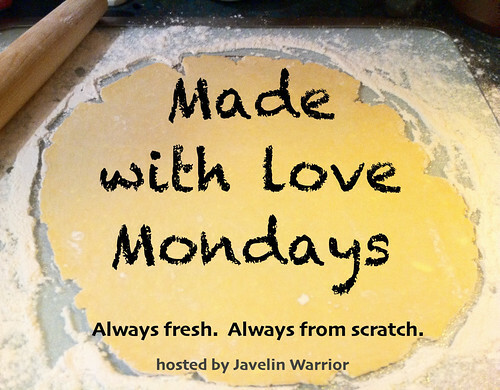 Next, I enter this post as well to Javelin Warrior's Made with Luv Mondays, even though it is still Wednesday. Finally, after everything has been said, I'm not keeping my mouth shut, although that will be the case very soon. Think again! What comes to your mind, when pondering food and movies? What movies pop up in your head and/or what foods? Let me know! Then you know, what to do. :-) With a hearty soup I can even manage 17°C in the house ... at least for a bit. Eating dinner with my family is akin to eating with aliens! I love a cabbage in soup. So good for the skin. Yours looks wonderful. Thanks for mentioning a positive effect of the soup. I hope dinner with you family is not too ... strange. I am a big fan of cabbage and make cabbage soup often, though Asian style. Would definitely like to try your way with herbs and potatoes. Asian style also sounds good to me. With this one, at the beginning the smell of lavender was dominating, but gladly it was not so in the taste in the final product. It has been a pleasure taking part. I guess, nearly every month, if not even week, I would have at least one dish with herbs on it ... and by looking at my garden, I could have a dish every day with thyme in it. 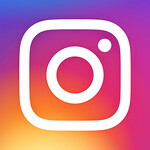 Why not leave a comment!? I love to receive messages. Your budget might not permit to travel all over the world. However, experiencing food from all over the world might be in reach. So much to try, so go for it and cook yourself around the world. There is a lot to discover and you would miss a lot not trying at least some of the things. Here you are in exactly the right place to explore different kitchens from around the world. Where do you want to travel to today? © 2012 - 2019 by Cooking Around the World. Powered by Blogger.